Don’t forget to enter our amazing giveaway from OnlineShoes.com and Patagonia to win a copy of this book and any pair of Patagonia shoes or boots you desire! Our children are like the canaries in the mine of how toxic our world is. It is not good. Our children are developing serious health conditions as a result, and parents need advice on how to create the safest homes possible for their little ones. Healthy Child Healthy World is the best resource on the internet for healthful solutions and increased awareness. Their publications do not disappoint. 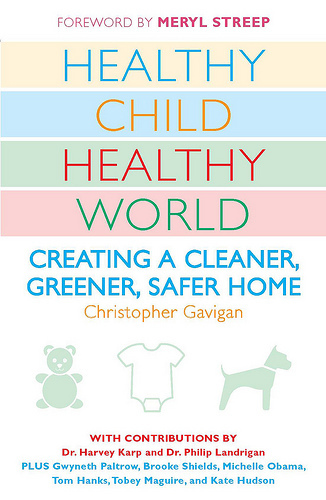 Healthy Child Healthy World: Creating a Cleaner, Greener, Safer Home by Christopher Gavigan is the “definitive guide to creating a healthy, nontoxic, and environmentally sound home”. Would I buy this book? Yes. There is something for everyone to learn. Jennifer, you ROCK!! You have always been a trusted resource for our work and a stalwart supporter of our mission. Thanks for the Healthy Child promotion and for everything you do. You are stellar! !